A beach vacation is a tactile experience. The sights, sounds, and especially the scent of being under sun and sea are what makes this class of holiday particularly memorable, and it is in that vein that Dolce&Gabbana has run to cultivate their Light Blue fragrance range. Dolce&Gabbana wants to get you into the festive mood with its new fragrance holiday gift sets available exclusively from 6 to 12 December at Robinsons The Hereen. The two fragrances are classics from the brand. 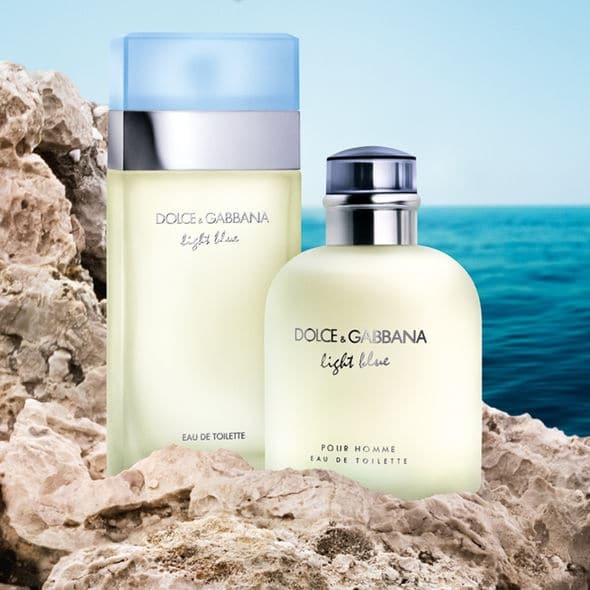 Created to evoke the scent of the scorching summer sun on sweat-beaded skin and salty sea breeze of the Mediterranean, the Dolce&Gabbana Light Blue comes in two crisp renditions, one for men and one for women. Two Dolce&Gabbana Light Blue perfumes. Light Blue Pour Homme captures what one would imagine Adonis’ perfume to be. Wood spice, Sicilian mandarin and bitter grapefruit mingle to create a lingering fragrance that is both juicy and fleshy when it touches the skin. As time passes, the perfume unfurls to notes of incense, oak and bergamot, evoking a bonfire by the beach at the hour where day becomes night. Light Blue is far more vivacious than its male counterpart. If this perfume could express an attitude, its apple, jasmine and white rose notes convey the carefree vibes of running through warm sand as the scent of fruit and flowers waft in from the mainland. Sicilian cedar, citron wood, amber and musk are added to the base to add depth to the feminine bouquet, making the scent more sensual as it develops on bare skin. Not all of us have the liberty of lounging on the pristine sand by the Mediterranean seaside 24/7, as much as we’d like to, but owning one of the Light Blue perfumes is a way of embodying the provocative mood of that vacation with you wherever you go. Light Blue is priced at S$86 (25ml), S$127 (50ml) and S$164 (100ml). Light Blue Pour Homme is priced at S$95 (40ml), S$119 (75ml) and S$165 (125ml). Available at all major departmental stores, Sephora and Sasa. For more information, click here.